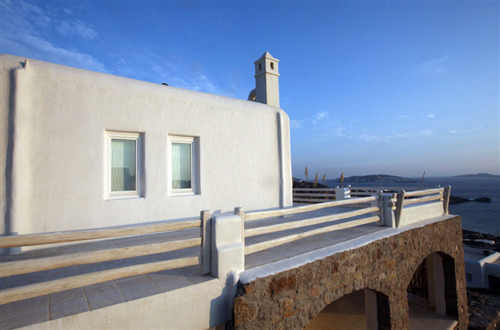 This luxury villa on Mykonos is a 3 bedroomed luxury villa situated at the peaceful spot of Choulakia, 300 meters from Choulakia beach, 1000 meters from Agios Stefanos beach and 3 km from Mykonos town. This wonderful villa offers stunning sea views and overlooks Delos Island. The sunset from this villa is an unforgettable experience. You can enjoy romantic dinners, sunset cocktails or sunset swims from the wonderful pool on the terrace. The interior of the villa covers a surface of 278 sq. m.
As you enter from the large backyard you enter the upper level of the villa. 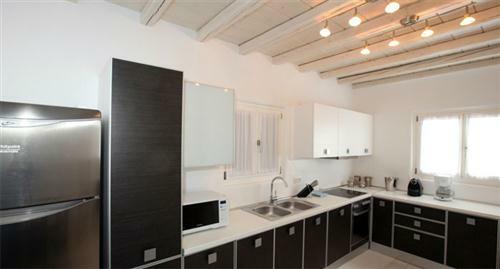 This level consists of a large sitting area with a fireplace, a dining area for 10 people and a fully equipped kitchen. Details like murano crystal lightfittins, luxury furnishings, crystal glasses and valuable porcelain give the villa a unique quality and luxury feeling. The villa is equipped with flat screen satellite TV and hi-fi. The kitchen is fully equipped with all modern appliances including ceramic hob oven, large refrigerator, dish washer and microwave. A large bathroom with a bathtub serves this floor. From the upper floor you can access a huge verandah which is equipped with a fully equipped, external bar with hi fi, a dinner table for 20 people, sitting area for 40 people and a large, built-in barbecue. There is a pool area with a deep infinity pool of 3,30 meters which overlooks the sea and the sunset. 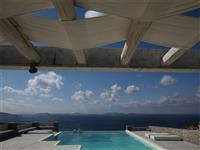 The size of the pool is 6 m. X 10 m. There is a large pergola of 100 sq. m that offers shade from the strong Mykonian sun. The pool area is served by an external WC and a shower. 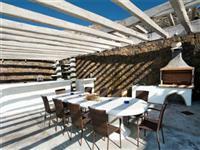 The external area of the villa can easily host a wedding party or other social event. From the sitting area there is a ladder leading to the ground floor where the 3 bedrooms are located. The unique master bedroom covers an area of 80 sq. m.
You can even see the sea from the built-in, king sized bed in this bedroom. A private bathroom with a bathtub serves this bedroom. Two other comfortable bedrooms with double beds are situated on this floor. Both bedrooms share one bathroom with bathtub. All the bedrooms have access to a large verandah with exquisite sea views. This verandah offers tables, chairs and an open air gym at your disposal. The gym is equipped with a kettler multi-gym, benches, weights, crossover machine,treadmill, massage table. You can start the day working out in this open air gym overlooking the blue of the sea then dive into the deep pool. Two staff members that live in a separate staff house near the villa are at your disposal anytime. 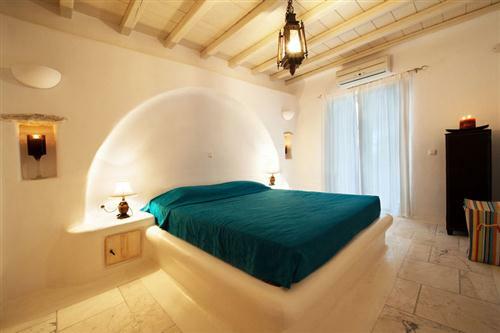 This luxury villa on Mykonos is situated at the peaceful spot of Choulakia, 300 meters from Choulakia beach,1000 meters from Agios Stefanos beach and 3 km from Mykonos town. For a fabulous, sun-soaked vacation, Mykonos is the perfect location as it is one of the most cosmopolitan and fun islands around. Check out the island’s main town, Hora, and spend some time exploring the narrow, cobble-painted streets enveloped by the famous Cycladic white washed homes and shops, which are boldly accented with brightly colored wooden doors and windows. The streets, which were designed to confuse pirates in the 16th century, now offer a lovely walk through fashionable boutiques, taverns, and small churches and chapels. Mykonos has some of the most beautiful sandy beaches in the Cyclades. There are busy beaches, which have the vibe of a daytime club, and there are secluded beaches where you can get away from the crowds. Elia, Panormos, Agios Stefanos, Psarou, Kalo Livadi, Paradise and Ornos are the most popular beaches on the island. After a day at the beach you can head over to the famous Mykonos Harbour – or Little Venice, as it is known, which will enchant you with the fantastic views of the crystal-blue Aegean sea. Watch the sunset and listen to the waves crash against the promenade while you relax in the evening in one of the many cafes. 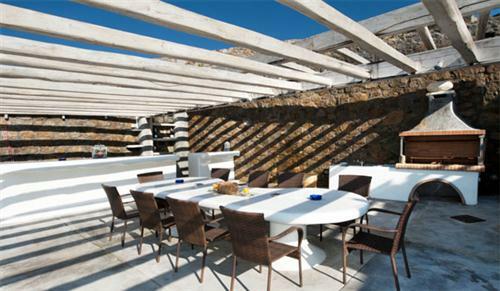 Mykonos is well known for its sophisticated and fun nightlife, which stay open until the early hours of the morning. At night Mykonos comes alive with a large variety of night clubs, bars, and discos. Location map placement is approximate. Above rates are per night and include daily maid service, taxes and transfers from / to the port/airport. A 50 % non refundable deposit is required at the time of booking. The rest of the amount is to be settled one month prior to arrival. Notes: Bathroom 1 is the WC and the outside shower by the pool. Bathroom 2 in on the upper living area and has a bathtub. Bathroom 3 is is for use with the master bedroom.